Make your yard bloom with rustic charm as the green leaves of your favorite potted plants or herbs peek out from this outdoor wood planter box. 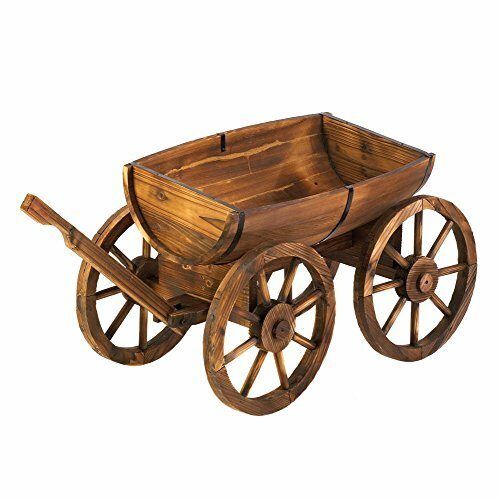 This large garden planters wagon is made from half of a wooden apple barrel, and the wooden wagon wheels that are expertly crafted. with a lovely stained wood finish. This outdoor flower planters yard decor will be admired by the whole neighborhood! contents not included. To preserve the beauty and finish of the contemporary outdoor planters, applying an epoxy clear coat once a year is recommended. This large planter box wood weight:18.4 pounds. the outdoor planter boxes dimensions:47.8" x 20" x 24.5".